Potted lilies can add colorful beauty to your patio or entryway. They are also good indoor plants during their bloom cycle. This is a guide about growing lilies in pots. I was lazy and now my bag of mixed variety Asiatic lilies (sitting outside the garage door) did not get planted this fall. I would like to plant them in a pot. Can I still do this and leave the pot outside in the New England winter, or should I wait till spring? You can go ahead and plant them, but depending on how long they have been sitting by the garage, the results may be disappointing. 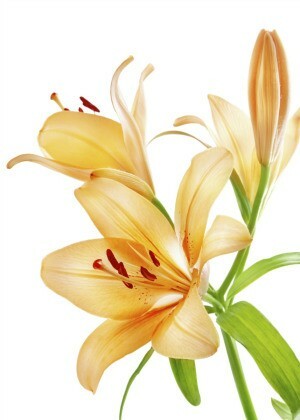 True Asiatic lilies do not go "dormant" like other bulbs. They should be planted with some of their live roots attached. This is why you see them for sale in pots rather than sold as bulbs. Once the roots are allowed to dry out, they die. As long as the roots haven't dried out and they don't show signs of mold, they will be okay. Plant them in pots that are deep enough so that you can plant the bulbs at a depth 2 1/2 to 3 times their height (about 6 inches). Use a slightly moist, fast draining potting soil. Asiatic lilies need a fair amount of room so space them from 9 to 18 inches apart. Most Asiatic lilies are hardy to zone 5, but just to be safe, you might want to bring them into a basement or unheated garage. It isn't the New England winter that worries me; it's the New England wildlife. Squirrels and mice venture out on warm winter days. Your lily bulbs would make an attractive mid-winter meal. It you would rather keep the pot outside, make sure you cover the pots with some screen or mesh to keep critters out. If you do bring the pots indoors, keep the bulbs at temperatures near 33ºF for the winter to prevent further sprouting. I planted stargazer lilies in pots for the first time last spring/summer. They did not do much. I always move all my pots into my semi-heated attached garage for winter and the stargazers are beginning to come up. They are very leggy and spindly, at least 12 inches tall. Do I let them grow and move them outside when it gets warmer or can I cut them back to get fuller growth? Do they grow from a bulb or root system? I think if you cut it off, plant outside when temps are warm, it'll grow and be fine. Search for "how to grow stargazer lilies in pots"lot of info there,good luck. It sounds like you watered your lilies too much to start with. If you cut them off you won't have blooms this year but if you stop watering them and let the top die then take it off you will have better luck. The legginess is because they didn't have enough light when they started to grow. I have planted calla lilies in pots and was wondering if I am suppose to prune these plants in any way to keep them more healthy. They seem to look great, but I have never grown them before and they are starting to fall a little. My understanding is that Calla Lilies are basically bog plants in the SE part of the country so I think they may need a little more water than most. Do I use ericaceous compost for growing stargazer and muscadet lilies in pots? Choose a larger pot for medium to tall lilies, at least 12 inches deep, and use a well drained growing medium. Some lilies require acid soil, and for this group, which includes star gazer and the other oriental hybrids, use a ericaceous compost soil mix and extra grit two thirds compost, one third horticultural grit.good luck.